Many assessments within SchoolCity SUITE can be administered online to students through the Student Portal. Scheduled students must be activated, and their progress monitored by the Test Administrator. This document will review the entire process for activating students and monitoring an online assessment. Please see the Help documents, Activating an Assessment With a PIN, and Activating an Assessment Without a PIN, for specific information on activating students. In the Assessment Manager, find the assessment you want to administer, and select the bolded online icon (computer monitor) (1b). Or, from the Launchpad, click on the ONLINE flip card. On the flipped side, select Schedule/Monitor (1c), then select the assessment you want to administer (1d). Activate Students With a 4-Digit PIN: In the Online Administration screen, note that all students have a vertical gray bar to the left of their ID numbers and are shown as Inactive in the column, Status of Items Attempted, also color-coded gray. Activate the entire roster by clicking on the box next to PIN in the top teal bar. Check marks will appear next to each student’s name and ID number. 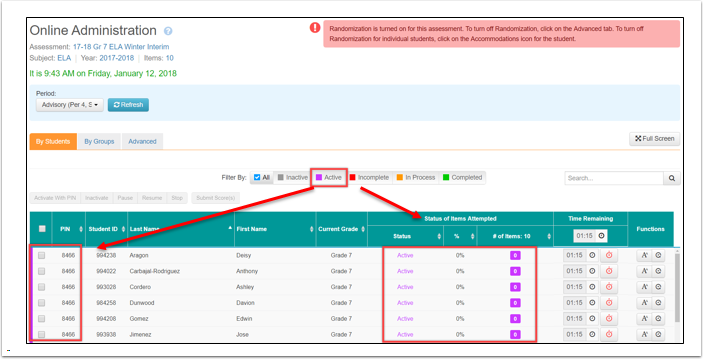 Or, to activate specific students, click on the box next to each student’s name and ID number. Once students have been selected, the Activate With PIN button will be bolded. To complete the activation process, click on Activate With PIN. PIN numbers will be randomly generated and a message will appear confirming the number of students who have been activated. Click OK. Active Status With PIN: Once activated, the gray bar next to each active student’s name will change to purple as indicated in the color-coding key, along with the PIN. Active, also in purple, will show in the column, Status of Items Attempted. Students are active, but have not yet started to view or answer any of the items in the Student Portal. Activate Students Without a PIN: Note that all students have a vertical gray bar to the left of their ID numbers and are shown as Inactive in the column, Status of Items Attempted, also color-coded gray. Activate the entire roster by clicking on the box next to Student ID in the top teal bar. Check marks will appear to the left of each student’s name and ID number. Or, to activate specific students, click on the box to the left of each student’s name and ID number. Once students have been selected, Activate will be bolded. To complete the activation process, click on Activate. A message will appear confirming the number of students who have been activated. Click OK. 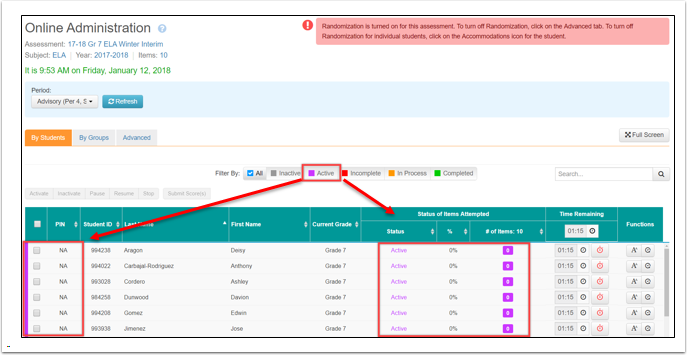 Active Status Without PIN: Once activated, the gray bar next to each active student’s name will change to purple as indicated in the color-coding key, and Active, also in purple, will show in the column, Status of Items Attempted. Students are active, but have not yet started to view or answer any of the items in the Student Portal. Inactivate Students after Activation: Once activated with or without a PIN, specific students or all students can be inactivated. Click on the bolded Inactivate button. A message will appear confirming this action. Click OK to continue. The selected student(s) will have a gray bar next to the ID number and Inactive will show in the column, Status of Items Attempted. 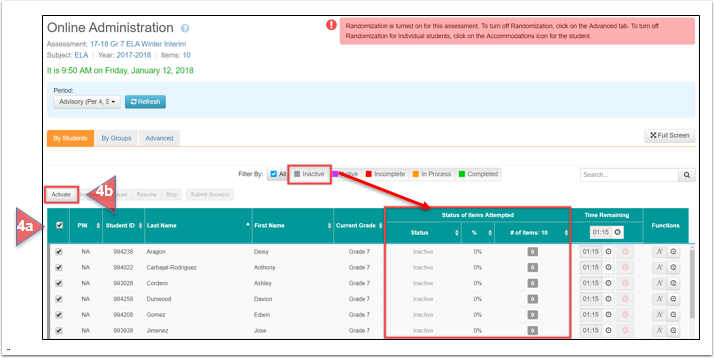 Duration and Timer: If you want to set a time limit for the assessment and did not set one during the assessment creation process, Duration may be set in Advanced Settings in the Online Administration screen. Note: This must be done BEFORE students are activated. From Online Administration, select the Advanced tab. Next to Duration, slide No to Yes. Set the Hours and Minutes by clicking in each box and using the up/down arrows to set the correct time. Select the Default Time Increment for increasing or decreasing the time during the test in the same way. Click Save in the lower right corner. Return to the Online Administration screen by clicking on the Students tab. The timer is displayed on the right side of the table. Increase or decrease the time for all students by the default increments you selected in Advanced Settings by clicking on the clock icon under Time Remaining. Use the up/down arrows to increase or decrease time. Once the time is correct, click on Apply. To disable the timer for a specific student, click on the red clock icon to the far right of the student’s name. A message will appear explaining that this will permanently remove the timer for the student and cannot be changed. Click on Proceed with disabling timer or Cancel. 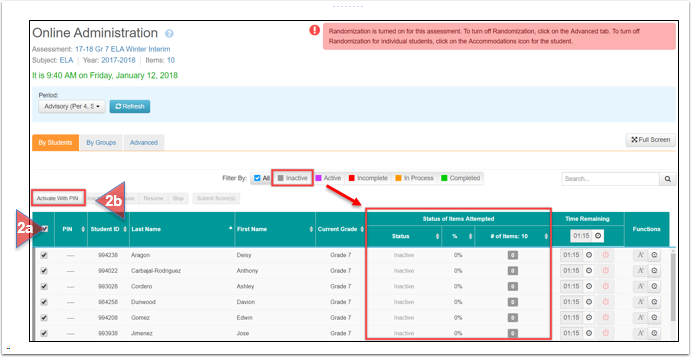 Monitoring Progress: As students begin to take the assessment in the Student Portal, their progress can be monitored on the Online Administration screen by using the color-coding key. The Active color (purple) will change depending on each student’s progress in completing the assessment. As students are working, you can click on any color to see the list of students in that category. The first student (Aragon) has attempted or answered 2 of 10 items (20%) and is still taking the test, as indicated by the orange bar next to her name. In the Status of Items Attempted, the percent completed and number of items in the orange box indicate her progress. She has 1:12 left in the testing window to complete the assessment. The fourth student (Dunwood) clicked on Exit Testing in the Student Portal while on item 5 with 1:14 left in the testing window, as indicated by the red bar next to his name. The word Exited and number of items are shown in red in the Status column. The fifth student (Gomez) closed the browser before completing the test. He has a red bar next to his ID number, and in the column, Status of Items Attempted, the word Incomplete is shown in red and the number of items completed so far are shown in a red box. The status of the reactivated student will now show as Reactivated. Wheneither starts to answer test items again, his status will change to In Process (orange). The third student (Cordero) submitted the test after answering 10 of 10 items, as indicated by the green bar next to his name, the word Completed, and number of items in green in the Status column. Note the timer has stopped. Pause and Resume: During the administration of the assessment, students who are In Process (orange) may need to take a short break of no more than 30 minutes. Check the box next to the student’s name. Click on Pause. This will temporarily stop the clock and suspend the test for that student. A red bar will appear next to the student’s ID number and the word Paused and number of items in red will show in the Status column. A message will appear informing you that a student’s test has been paused and how to resume testing. Click OK.
Students will also see a message in the Student Portal when the test administrator has paused the test. To resume testing, select the box(es) of the student(s) who have been paused, and then click Resume. Students can then proceed as before, and the status will return to In Process (orange). If for any reason you need to stop an assessment for students who are still In Process, check the box next to each student’s name, and click on the bolded Stop button. An alert will appear to verify that this is the desired action. Once a test is stopped for a student, it will lock them out of testing until they are made Active again. Click Stop Testing for Selected Students or Continue Testing. All selected students who have been stopped will now have a red bar next to their ID number. The word Stopped and number of items will appear in red in the Status column. To reactivate a stopped student, click on the box next to the student’s ID number, and then click on the bolded Activate button. The student’s status will change to Reactivated. He can log back into the Student Portal and continue testing. All previous work will have been saved. Once he begins taking the assessment again, his status will change to In Process (orange). To submit scores for a student who is Stopped, Exited or Incomplete (red), select the checkbox next to the student’s name, and click on the bolded Submit Score(s) button. This means the test is being completed for the student regardless of the student’s progress on the assessment. A message will appear verifying that this is the desired action. Click OK or Cancel. If OK was selected, a second message will appear confirming the submission of scores. Students whose scores have been submitted by the test administrator will have a green bar next to their ID number and name, and be shown as Completed in the Status column, along with the number of items completed. To delete scores for any student who is Completed (green) select the checkbox next to the student’s name, and click on the bolded Delete Score(s) button. A message will appear to verify that this is the desired action. Click Delete Scores or Cancel. After scores have been deleted, the students will be shown as Inactive (gray), and can be Activated again for this assessment, providing the testing window is still open. [Note: Only users with permission from the district to Resume Online Testing for the specific level of assessment may reactivate a completed student.] If a student has submitted the assessment for scoring in the Student Portal, but needs to resume testing for any reason, he/she can be activated again. This will remove all existing scores from the reports until the student submits the test again. Answers will not be deleted from the Student Portal. The student will have access to all items and will be able to make edits and revisions as needed. Select the completed student(s) you wish to resume testing by checking the box next to their ID number and name. Select Activate With Pin or Activate, depending on whether a 4-digit PIN verification was set in Advanced Settings or not. A new PIN will be generated for the student to use to resume testing. The Resume Online Testing dialogue box will appear describing the consequences of this action. 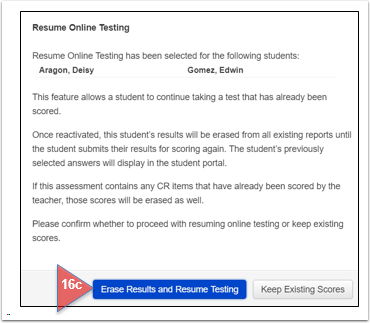 Click on Erase Results and Resume Testing or Keep Existing Scores. View Results: Once all students have submitted their assessments for scoring, you can view the results in the Report Manager. Access the reports from the Top Menu Bar by clicking on Reports. Or, from the Launchpad, click on the REPORTS flip card to select the desired report on the flipped side.